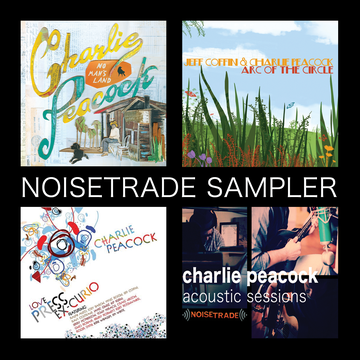 Charlie Peacock's adventurous resume makes him a difficult musician to categorize. The Grammy Award-winning, performer, songwriter and producer has excelled in pop, gospel, country, Folk-Americana, and jazz. Peacock began his iconoclastic career in the 1980s with recordings for A&M, Island, and Sparrow/EMI. Alongside his own career as a performer, Peacock has played a lead role in creating major hits over the last two decades—most notably Amy Grant's "Every Heartbeat" (1991), Switchfoot's "Dare You to Move" (2002) and The Civil Wars' Gold debut album Barton Hollow (2011)—earning Grammys for Best Folk Album and Country Duo. Named by Billboard's Encyclopedia of Record Producers as one of the 500 most important record producers in music history, the award-winning artist-producer is known as a committed advocate of artistic freedom and risk. In 2012 Peacock diverted from his recent jazz recordings to produce his own return to vocal performance, the Folk/Americana flavored No Man’s Land.